It’s likely been an exhausting stretch of hockey for players on the Edmonton Oilers. The team has not had more than one day off between games since October 22. The team has played 9 games in the last 15 days. Signs of fatigue are apparent as was seen in the Oilers last two games. They were outworked and out hustled by very strong Washington and Tampa Bay teams. Despite the last couple of loses Edmonton still finds themselves better than simply treading water. The team has not lost more than two games in a row yet this season and have a good chance of turning their fortunes around against a struggling Florida Panthers team. The Panthers have run into a bit of bad luck to start the season. 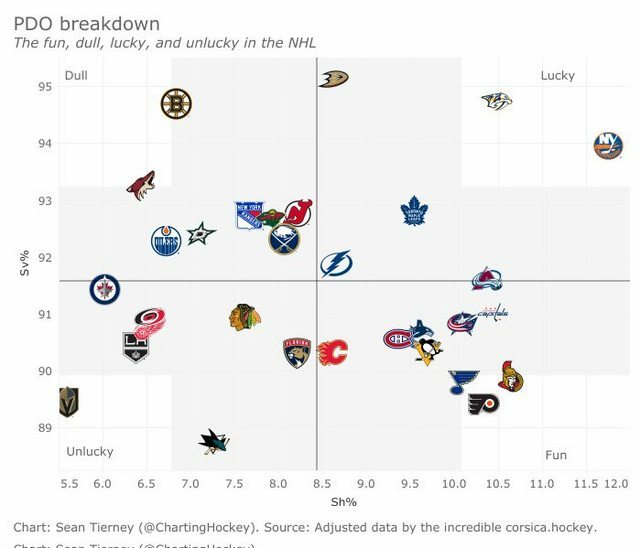 A couple of charts courtesy of Sean Tierney help to illustrate that the Panthers may not be as bad as their record illustrates. 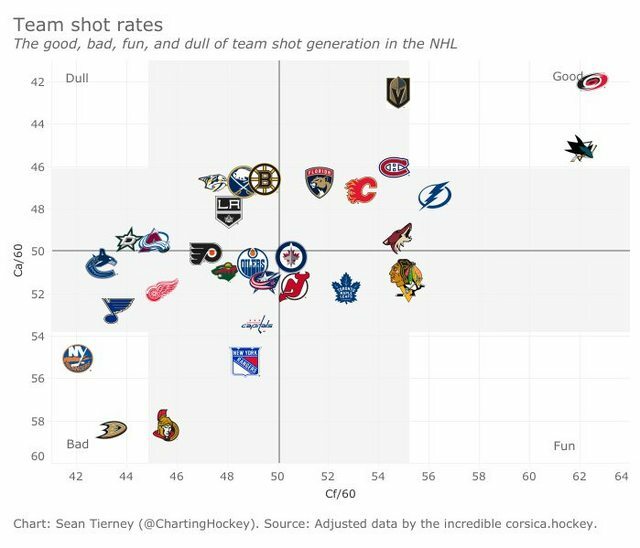 This first chart is a great way to illustrate how all teams in the NHL create and limit chances. Ideally all teams want to be in the top right quadrant, producing the most chances while limiting the opposition. Edmonton, for example, is right in the middle of the pack as a team which is has had success in both creating chances and limiting the opposition’s shot chances. The second chart details PDO. PDO is something I would like to spend a bit more time focusing on in future blogs. For those who don’t know, PDO is the addition of on-ice save percentage to on-ice shooting percentage. At its simplest explanation it is a way to try to quantify puck luck. This would be a great conversation for another day but my point here is that this shows the Panthers are a team that are due to start getting some more goals. I have no issue with the league fining Milan Lucic for his hit on Mathieu Joseph and honestly I expected him to get at least a game for it. It wasn’t that the hit itself was brutal by any means but Lucic tracked him down from one end of the ice to the other with the clear intention of what he was going to do. Check out this completely unedited clip of what happened. Will probably update this several more times throughout the day. With Yamamoto and Puljujarvi playing musical chairs in the press-box it is anyone's guess as to who will be sitting (hint-it’s Puljujarvi). Yamamoto out and Puljujarvi will average about 10 minutes tonight on the fourth line. Once again... get both of these players into the AHL. 2) Watch Russell’s icetime. Kris Russell is starting to Russell again. The Nurse-Russell pairing has been the weak link in the Oilers defence as of late. Both Russell and Nurse are players who attack the puck and forget about the overall play. Benning has been playing better again as of late and it might be time to give Russell a game or two on the third pairing. 3) Yandle’s Still Got It. Who is currently one of the best scoring defencemen on the PP? That is right Keith Yandle of course. The 32 year old has 12 points already this season with five of them 2G,3A coming on the powerplay. Edmonton needs to keep an eye on the veteran and block shot lanes. 4) Whatever Is Left In The Tank. Edmonton is a team playing tired but after today they get a two day break before returning to games in Edmonton. The Oil need to bring whatever they have left tonight knowing it will feel much better to sleep in their own beds with a victory. Considering a number of my readers do enjoy fantasy hockey I thought that you all might enjoy some of my thoughts on players you may wish to start or drop based on Edmonton’s matchups. I love your feedback so please let me know if this is something you would like me to continue. Ryan Nugent Hopkins - Has 11 points in 10 games against the Panthers and has 5 points in his past 5 games. Cam Talbot - Despite some of his recent woes Talbot has solid numbers against the Panthers with a record of 5-2. NOTE - Talbot does have a 2.70GA rate against the Panthers which isn’t great but if the win means more than a couple goals scored I would start him. Nick Bjugstad - Had a bit of a rough start to the season but has looked better as of recent. He is shooting much more again and thus has been rewarded with more shifts over his past 4 games. Mike Hoffman - Hoffman is hot right now with 4 goals in his last 5 games. He is averaging over 5 shots a game right now. Oscar Klefbom - Klefbom is a decent later round pick and depending on how he is playing can be a steal in deeper drafts. Klef only has a single goal in 6 games versus the Panthers so don’t expect him to explode tonight. Aleskander Barkov - I know I had written above that Barkov is a dangerous weapon but truth be told his numbers against Edmonton are not that impressive. All time he has 5 points in 8 games managing only one goal against the OIl. He also career-wise is a -4 against Edmonton. The Oilers need to rebound tonight if they want to finish this road trip at .500. Rebounds...basketball.... you guys should get how this works by now. Anyways please take a few minute break from your work day and meet the team from Hoosiers.